Soothes, relieves and protects dry, sore or sensitive mouths. Strengthens enamel and reduces plaque formation. Supplements saliva's natural protective mechanisms. Helps maintain mouth's natural balance and cleanse, refresh and lubricate the mouth. Use at any time during the day for freshness. Extra gentle. Alcohol and menthol free. BioXtra Dry Mouth Ultra Mild Mouthrinse gently supplements natural saliva by regulating the microenvironment of the mouth. The mild tasting formulation strengthens enamel, helps fight against the formation of dental caries and ease the symptoms and effects of dry mouth (xerostomia). It helps maintain your mouth’s natural balance and cleanse, refresh and lubricate your mouth. The bioXtra Dry Mouth Ultra Mild Mouthrinse is alcohol and menthol free. Special ingredients in bioXtra provide an immediate feeling of moisture and help regulate the microenvironment of the mouth. STEP 1 – CLEANSING: At least twice daily brush with BioXtra Dry Mouth Toothpaste. STEP 2 – RINSING: Rinse with BioXtra Dry Mouth Ultra Mild Mouthrinse after brushing and, if desired, at regular intervals during the day for extra freshness and comfort. STEP 3 – MOISTURISING: For long-lasting lubrication and comfort, especially at night, apply BioXtra Dry Mouth Oral Gel to gums or under dentures. 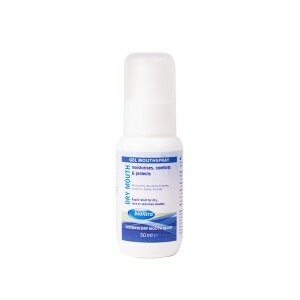 For convenience and immediate moisturisation during the day spray BioXtra Dry Mouth Gel Mouthspray directly into the mouth as often as required. Used together daily, BioXtra’s unique formulations gently ease the symptoms of dry mouth (xerostomia), leave your mouth feeling fresh and comfortable, day at night, and help promote good oral health. water. Use regularly throughout the day to maintain comfort and freshness. Do not swallow. Do not exceed five times per day. Close cap after use. Contains sodium monofluorophosphate (max 1500 ppm). Not suitable for children of 6 years and under. Supervise children as necessary until capable of using without supervision. Keep out of the reach of children. Aqua, propylene glycol, Xylitol, Poloxamer 407, sodium Monofluorophosphate, sodium benzoate, Hydroxyethyl cellulose, whey extract, Aroma, Lactoferrin, Lysozyme, glucose Oxidase, Aloe Barbadensis EDTA. Contains Lactoperoxidase, Lysozyme and Lactoferrin enzymes that are often depleted as part of dry mouth syndrome. BioXtra products contain traces of milk and egg-white proteins. Do not use if allergic to any of the ingredients. Does not contain alcohol, menthol or foaming agents.